Vintage Sunglasses Shop offered a similar pair Jean Paul Gaultier sunglasses (but in metal, not gold colour), model number 56-0173, see it here. The glasses have a round dark leness. 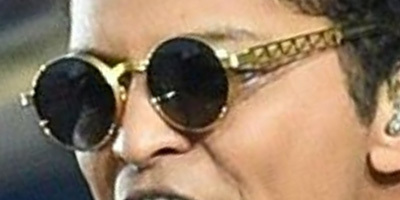 The frame is gold with a triangle pattern, similar to Gaultier's other Eiffel Tower inspired glasses models. The Super Bowl 50 halftime show took place on February 7, 2016, at Levi's Stadium in Santa Clara, California as part of Super Bowl 50. The show was headlined by the British rock group Coldplay with special guest performers Beyoncé and Bruno Mars and Mark Ronson.